Alias – the Best of 2013 to 2015! Today marks two whole years for this ridiculous blog. Thanks to all of you for hanging out and going on adventures with us! 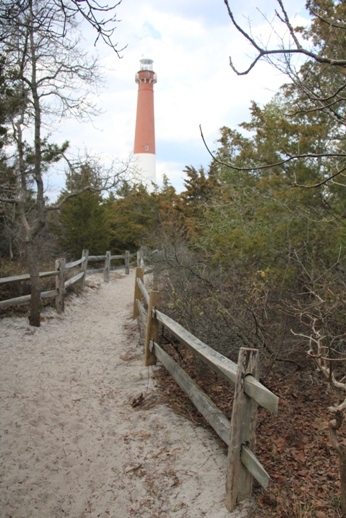 #10 – Maritime Trail – Barnegat Lighthouse State Park – Barnegat Light, Ocean County, NJ – This is one of the shortest trails that we’ve covered at just under a quarter mile, but it’s a sweet one. This trail is the way barrier islands once looked before becoming covered in boardwalks and ice cream stands (not that I have a problem with boardwalks and ice cream stands), and it throws you for a loop! Mile after mile of houses packed in and, suddenly, this tiny patch of silence. The views of the ocean are okay are the first stretch, but when you drop down into the dark hollow between the dunes and the air cools, off, it’s like another planet. You emerge from that hollow to some great views of Barnegat Lighthouse. Keep an eye out for the concrete blocks for the no-longer-standing radio tower. 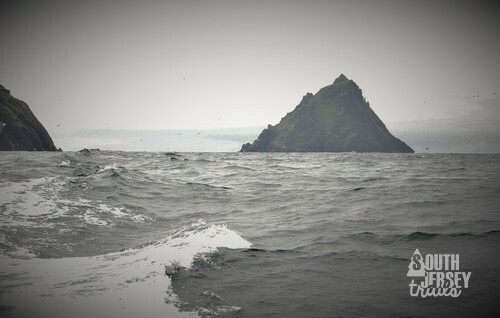 Being next to my favorite lighthouse in the world doesn’t hurt either. Climb the steps for the great view! #9 – Wenonah Woods, Wenonah, Gloucester County, NJ – Wenonah is not a huge town, but they’ve built up an impressive 12 mile or so trail system south and west of the town. The Pres and I tackled the trails east of the tracks so far (about 2 1/2 miles at this end), and we had a blast. Deep, dark forests, lots of little bridges over streams and creeks, and a good sized lake at the end (with a house right on it for sale that we’d love to buy). It’s also far more challenging than I’d expected, with some up and down, some decent (for South Jersey) elevation rises and drops, and a tricky ridge balance where I made The Pres hold my hand to keep me safe. When the weather gets warm, the trails west of the tracks are on The Pres and I’s to do list. #8 –Black Run Preserve Trails, Evesham Township, Burlington County, NJ – I discovered these trails exactly a week AFTER I moved out of Marlton. I’ve been kicking myself ever since that I didn’t find them earlier, as Black Run quickly became one of my favorite spots in South Jersey. Our regular run is a bit under 3 miles, but there are more trails to explore along the way. The trails run a good bit along old dirt roads, and even a minute from Kettle Run Road, I feel like I’m in the middle of the pinelands. The old cranberry bogs back here are beautiful. The best part? The highly active Friends of Black Run Preserve who are working hard to maintain and spread the great trail system through this preserved corner of Evesham Township. That’s right, it’s only getting better folks! 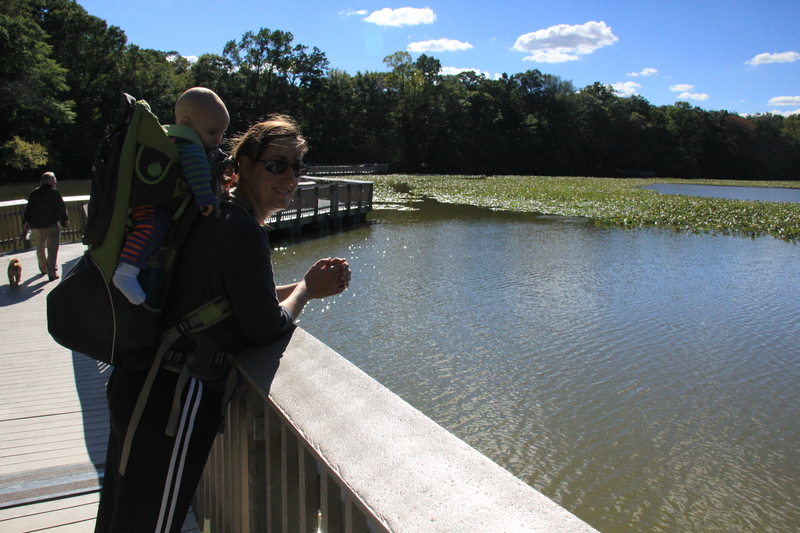 #7 – John Roebling Memorial Park – Hamilton Township, Mercer County, NJ – This hike transverses the Abbott Marshlands (formerly the Hamilton-Trenton-Bordentown Marsh) centered around where Crosswicks Creek enters the Delaware River. 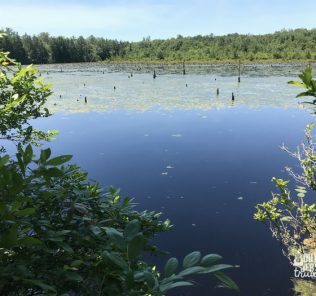 The Abbott Marshlands (championed by the Friends of the Marsh) offers about a dozen trails in five separate parts scattered through the marshlands, but this is the best. You park at Spring Lake and stroll around this manmade lake, created as part of the White City Amusement Park. The willow trees and park benches create a nice spot to sit down and take in the view. When you’re done sitting, it’s straight ahead across a tiny bridge into the marshlands proper. Here we saw birds, evidence of deer, and (coolest of all) beaver, who have both lodges and dams visible from the trailway. When you’re done with the marsh, it’s back to strolling around Spring Lake, finishing up by the grand staircase that is the only remaining feature of the old amusement park. All this covered in a mere 2 1/2 miles, with options to stretch your hike out to about five miles. So, in a mere 2 1/2 miles you get beautiful, cultivated parkland, the wild marsh, and remains of an amusement park. Perfect hike. And yet, there are still six more hikes to cover. 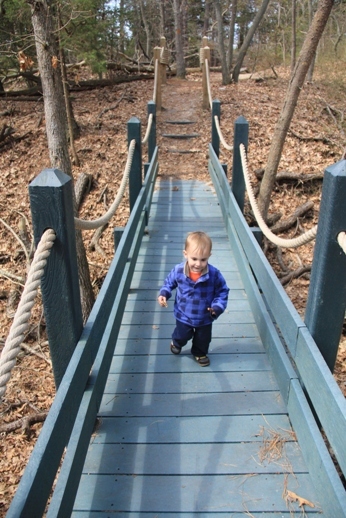 #6 – Cove Trail – Palmyra Nature Park – Palmyra, Burlington County, NJ – A grand hike along the Delaware, this trail goes from the Nature Center (the expansive and really impressive nature center) along the bank of the Delaware. You’ll catch great views of the bridges and the Philadelphia skyline as the land alongside the trail gets narrower and narrower and narrower. Eventually, it’s narrow enough that you wonder if you’re still on a trail or if you missed an “end of trail” sign somewhere. Then you break through and cross the sizable Pennsauken Creek on a footbridge. The trail continues for a bit on the other side, along boardwalks and passed abandoned cars that will leave you wondering how in the world that someone got them back here. On the way back (same as the way out), you’ll have ample opportunities to admire the birds in the back ponds, and options to expand this 2 mile hike into something longer. Seriously, this is still the trail. And I get it. Right smack in the middle of heavily populated Camden County, these trails traverse an old military installation/gravel pit. 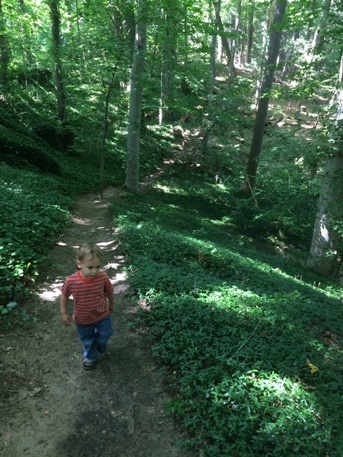 They meander through some nice woods before you get the option to turn left and climb to the top of Blueberry Hill. Your reward? A view of the Philadelphia skyline 13 miles off. You can wander around on trails, both paved and unpaved, marked and unmarked along the tops of the hill, before returning to civilization (usual route is about 3 miles, maybe 4 miles of trails total). Check out the old Nike Radar base while you’re there (but from a distance). Checking out Philly. Or napping. Your call. 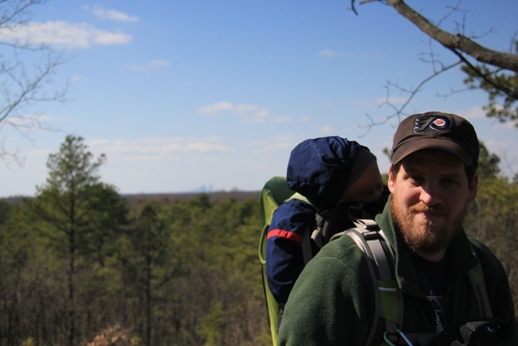 #4 – Rancocas State Park (South End) – Hainsport, Burlington County, NJ – This next hike I put off doing over and over again for various reasons, until the folks at Ventures to Anomaly talked me into moving to the top of the list. Totally good call. This park offers eight miles of heavily wooded trails. We did four miles following the outside, mostly on the Blue Trail. I LOVE that we saw only two other people in our three hours here. The woods are of a nice pine barrensesque flavor and the views of Rancocas Creek are lovely. But what really did it for me was looking for the remains of when people lived here in beautiful homes along the creek. Bits of masonry, old foundations, stone steps leading from old dock pilings are just a few of the things I found along the way. Nature AND history both at once? With hardly anyone else clogging the trails? Yes, please. 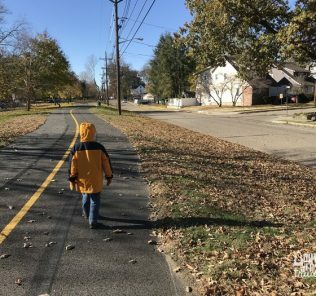 #3 – Historic Smithville Park Trail – Eastampton, Burlington County, NJ – This 4.1 miles of trail was one of the first hikes we did specifically for blogging purposes, and it was one of the best! The strolls through woods and meadows are certainly nice, but what makes this place special are the remains of the old town and the trail on the lake. That’s right, on the lake. The factories are what remain of the old Star Bicycle Company. The day we were there, we only checked out the remains of the factory (there was a concert going on and it was really crowded in that direction), but you can check out the old factory town and the mansion of Hezekiah Smith, which are supposed to be awesome. 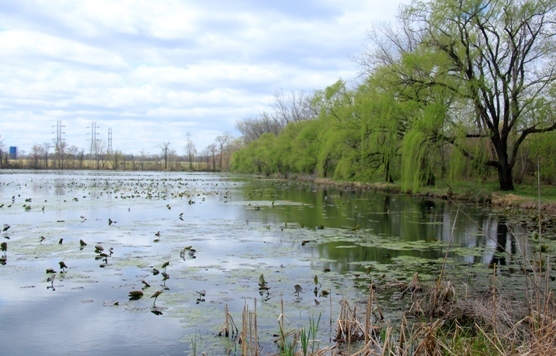 While history is great, the other big draw was the trail on the lake. They’ve built a floating trail using pontoons, and it’s seriously awesome. Floating bridges put babies to sleep. 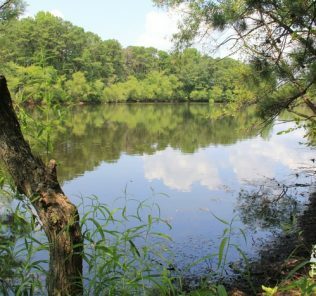 #2 – Maurice River Bluffs Preserve – Millville, Cumberland County, NJ – When I first made this Top 10 list, this trail was much lower on it, but I kept bumping it up and up and up as I remembered all of the highlights of our 4 mile adventure (5 miles total). Best of all, the trails were anything but crowded (I saw two other people the whole time The Pres and I were there, each in the parking lot). Woods and meadows, a really nice bridge, a bird blind, the ruins of an old (and picturesque) house, and a floating dock with great views up and down the Maurice River are all highlights before you’re a mile and half in. Hope you rested at the dock, because the rest of the trail is a roller coaster of ups and downs, a real leg burner, even having a section of switchbacks!!! You’ll end up near the parking lot at the end. All that stuff? That’s just the first part of the trail. 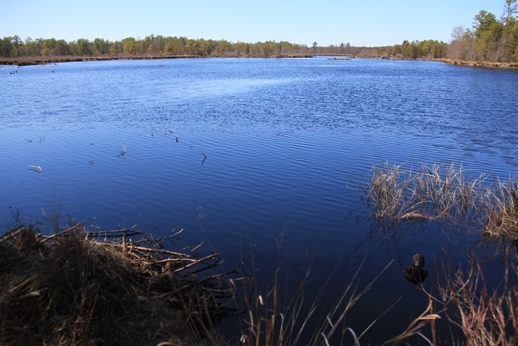 You then head north away from the parking lot for another several miles, the highlight of which is a grand view of the Maurice River, where there is a picnic table. Snack and enjoy the view. This trail feels like an adventure and is totally worth how your legs will feel the next day when you wake up. Thanks yet again to Mary for recommending this one! #1 – Batona Trail – Apple Pie Hill to Rt 72 – Franklin Parker Preserve – Chatsworth/New Lisbon, Burlington County, NJ – At long last, the #1 trail is the a swath of the trail nearest and dearest to my heart – The Batona. For those that don’t know, the Batona is South Jersey’s longest trail (and one of the state’s longest, beaten only by the Appalachian Trail and the D&R Canal Towpath). This is my favorite section, covered from Rt 72 to Apple Pie Hill, traversing almost entirely through the Parker Preserve. What makes this 8.2 mile trail so great? Going the opposite direction of my post (I’ve hiked it each way more than once), it starts with a really awesome stretch of trail that has you balancing on boards as you go from tiny island to tiny island in a swamp. That alone would probably get it on the Top 10, but you still have 7 1/2 miles to go. 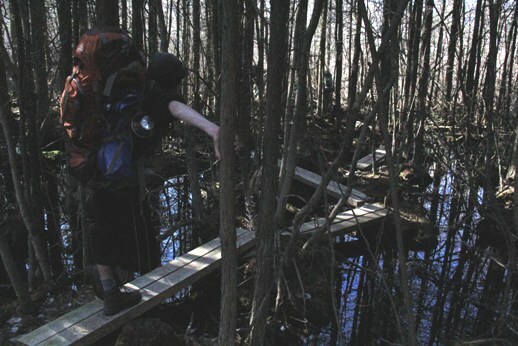 The rest of the way has large stretches of pitch pines, beautiful views of old bogs, tiny (but well constructed) log bridges across streams, long walks along cranberry dikes, and some interesting bushwacking around puddles. It’s not an easy stroll, but it’s super adventurous and exciting and fun. Think you’re done? Think again. This trail finishes at one of the best spots in the pine barrens, Apple Pie Hill. Climb the hill, climb the fire tower, and if it’s a clear day, you’ll be able to see Philadelphia and Atlantic City. Even on a not clear day, the views in every direction from the fire tower are as gorgeous as anything you’ll find in the state. Note – As of Labor Day 2016, the fire tower is now fenced off, limiting access. You can still climb it when it’s manned, but it is not always manned. 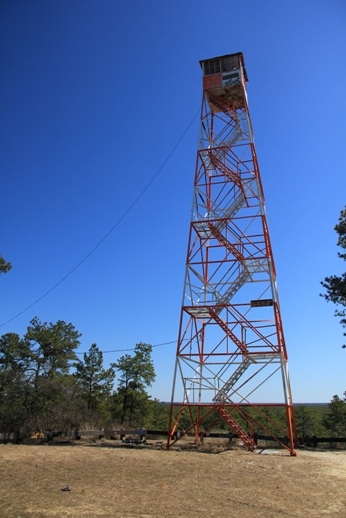 Visitors to the fire tower can call NJ Forest Fire Service Division B Headquarters to find out of the tower is manned. The number is (609) 726-9010. 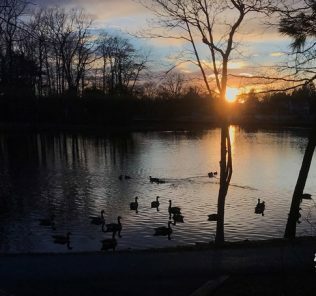 So there’s our Top 10, what’s your favorite trail in South Jersey? Let us know! Then get out there as this weather gets better and take in some new ones! Thanks to actual writer Peter Dabbene for the suggestion! Most of all, thank you to those who bother to keep reading this blog and most especially the really crazy ones who come out hiking with me and The Pres! We’re having a great time doing this! 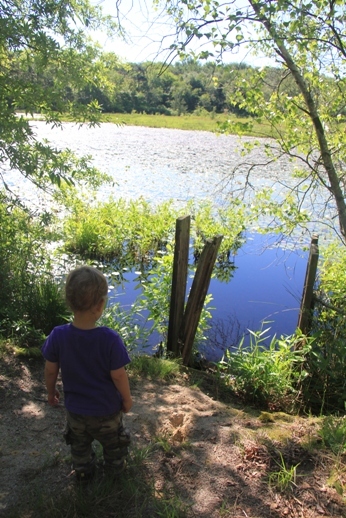 And with our “Future Hikes” list longer than our “Trails Reviewed” one, this is far from our last anniversary posting! 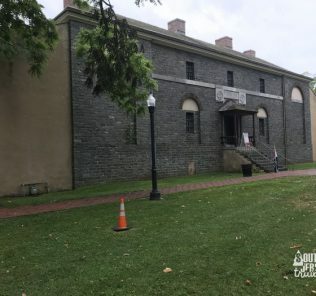 Burlington County, Camden County, Cumberland County, Gloucester County, Hiking, History, Mercer County, Ocean County, Outdoors., pine barrens, Private Park, South Jersey, State Park, Town Park, Wildlife. Thanks, Mike for the list. Dave & I have to go hike 4 places on your list. Can’t wait for the nicer weather so we can get out. Me either! Bring on the warm! I done just about all the trails on this list and wholeheartedly agree! Just added a whole bunch to my list! I really do have to get out more. 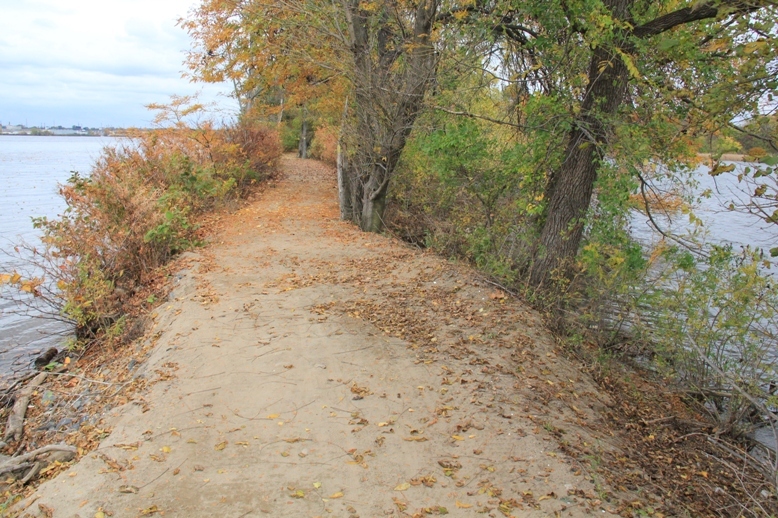 The only ones I have done from your list are the Maritime Trail and some trails at Rancocas. I interned at the Audubon Society (before they pulled out) there during college. I have fond memories of leading kids with the summer nature program all over those woods. gloucester a Township has a large park called Timber Creek. There is a fenced in dog park but also 2 trails throught the woods. It’s lovely in the spring! Hartshorne Woods Park??? Should be number one! Hawthorne, although awesome, is not South Jersey. Happy to hear of more spots to go canoeing! I’ve gone canoeing dozens of times, but nearly every time it was on the Wading, so I’m happy to hear about more places! Very handy list! I made plans to hike Wenonah trails tomorrow. I’ve completed two. #1 and #9. Curious to try the others. Great blog! 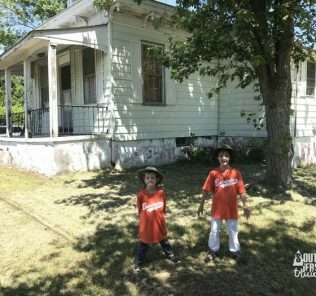 Great site thanks for taking the time to tell us about these great spots!